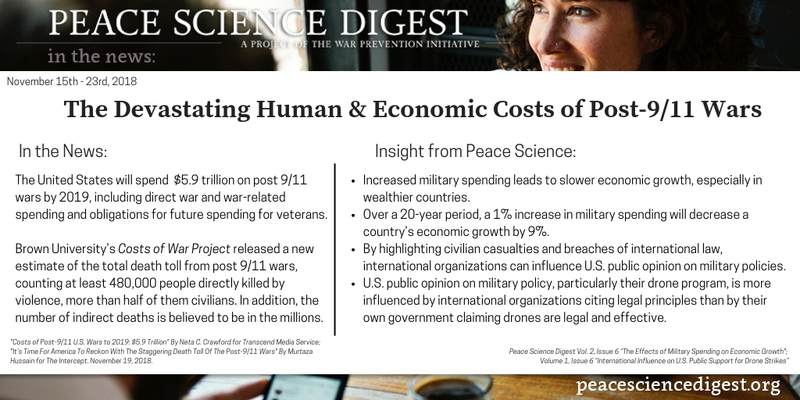 A new report from Brown University’s Cost of War project provides updated estimates on the devastating human and economic costs of the United State’s post 9/11 wars in Iraq, Afghanistan, and Pakistan. By highlighting civilian casualties and breaches of international law, international organizations can influence U.S. public opinion on military policies. U.S. public opinion on military policy, particularly their drone program, is more influenced by international organizations citing legal principles than by their own government claiming drones are legal and effective. Increased military spending leads to slower, and in some cases negative, economic growth. “Costs of Post-9/11 U.S. Wars to 2019: $5.9 Trillion” By Neta C. Crawford for Transcend Media Service. November 19, 2018. “It’s Time For America To Reckon With The Staggering Death Toll Of The Post-9/11 Wars” By Murtaza Hussain for The Intercept. November 19, 2018.